Besides art, yoga and meditation have also been my passions for many years and I have been using these practices as vehicles for entering and deepening my creative process. I shared this in an informal way with my students and saw the many benefits that they experienced. In 2008, I decided to do the Kripalu Yoga Teacher’s Training Program to deepen my practice and to be able to share my knowledge in a more formal way with others. I have found that when I allow myself to connect with my body, calm my mind, and center myself, creativity flows and I am able to tap into a universal creative source. Time seems to stand still and often the painting seems to paint itself. This process for many people can be a healing and transformative experience. This summer I will be facilitating a unique workshop Acrylic, Collage and Yoga, at The Haliburton School of the Arts which I am very excited about. It is my hope that this process of combining painting with yoga and meditation will enable the students to relax, calm their minds, center themselves, and enter deeply into their own creative process. We will start each morning with an hour of yoga and then proceed directly into painting. At the end of the day we will do a gentle restorative yoga session which will help to restore energy and reduce body aches usually accompanying many hours of standing and painting. 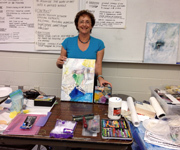 To register for the class please contact the Haliburton School of the Arts. What an amazing way to transition from the every day into a world of creativity and exploration. 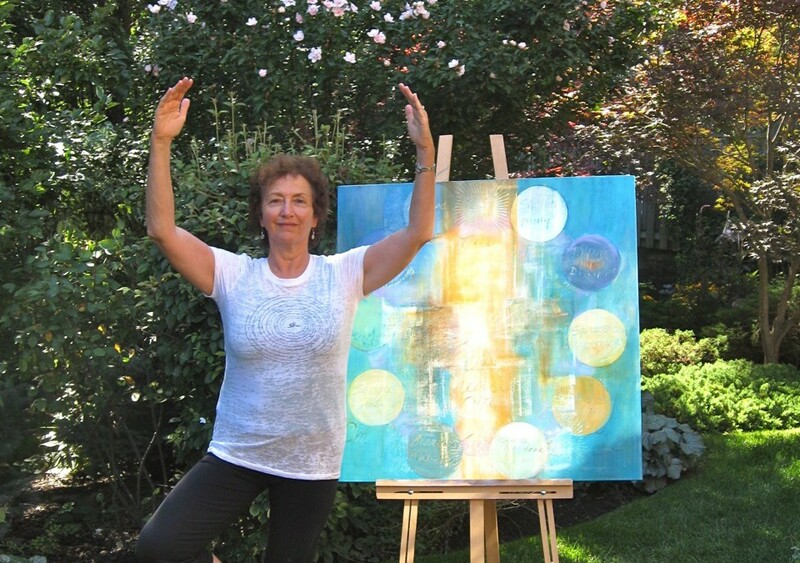 Having taken both Jill’s yoga and art classes, I believe that there is no better teacher to direct and lead one into the place of harmony, balance and creativity.